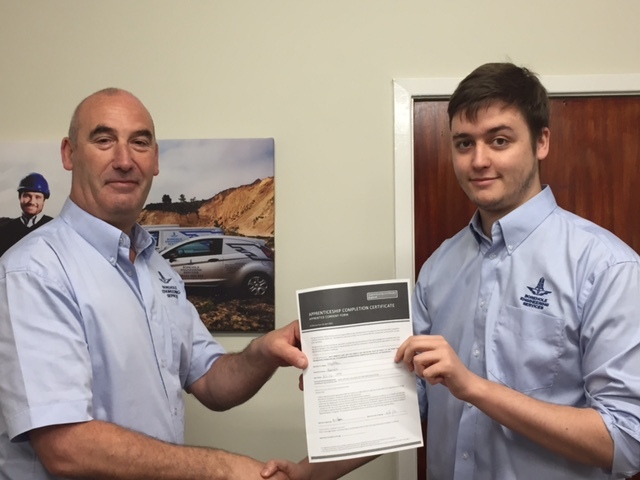 An apprenticeship is an excellent way for school leavers to gain access into the working environment and Drilcorp Ltd is very keen to offer these enthusiastic young achievers training in various disciplines throughout the business. I have completed a City and Guilds Level 3 NVQ in Engineering Technical Support and it took 2 years to complete. I took part in a lot of different projects with BES under the guidance and supervision of Michael Bushby, Contracts Manager and David T Gowans, Estimator. Learning on the job through BES has been a great experience because I wasn’t treated like I was a student. It was as if I was a proper project manager but under close supervision and I believe I performed better because of this. The jobs varied from simple domestic installation through to re-lining large diameter wells for Scottish Water. And when required I spent time on site being trained on how to carry out the projects myself. I believe an apprenticeship was the best way forward with my career because I’d still attended college while getting hands on experience of the job I want. As a result of completing my apprenticeship, I have gained the necessary skills to assist me in completing jobs of all sizes to the highest of standards. It has allowed me to progress as a person for example communicating with the general public and to communicate and develop within a team. I’m now a trainee Project Manager within the BES Division under the supervision of Michael Bushby Contracts Manager. I’ll also be going through my PRINCE 2 qualification and following that I’ll be undergoing my HNC in Civil Engineering. There are many benefits to completing an apprenticeship, you receive tailored training in your chosen career path and you also earn a wage whilst attending both work and college. It will also give you an insight into the working industry and how things work on a day to day basis. Drilcorp’s David Gowans CEO commented “It’s a good feeling to know that you have contributed towards the training that will one day launch the careers of these young individuals. At Drilcorp we are very impressed with the Apprenticeship system which is an excellent route for a young person to launch their career. We are delighted with Matty’s achievements and welcome him on board as part of the team”. Since completing his Apprenticeship Matty has successfully passed his Prince 2 Foundation and Practitioner allowing him to act as a member of the Project Management Team. In October Matty will commence his HNC in Civil Engineering.